It’s a fast, fun read; a men’s action/adventure packed with interesting characters, life threatening situations and snappy dialogue. And, so far, the women love it, too! I must warn you that due to colorful language, violence and sexual situations, this one is not for the kiddies. If you put this one down before you’re finished, I’ll … well, I’ll be very disappointed. For more info, go to the Knight’s Big Easy page, NOW! 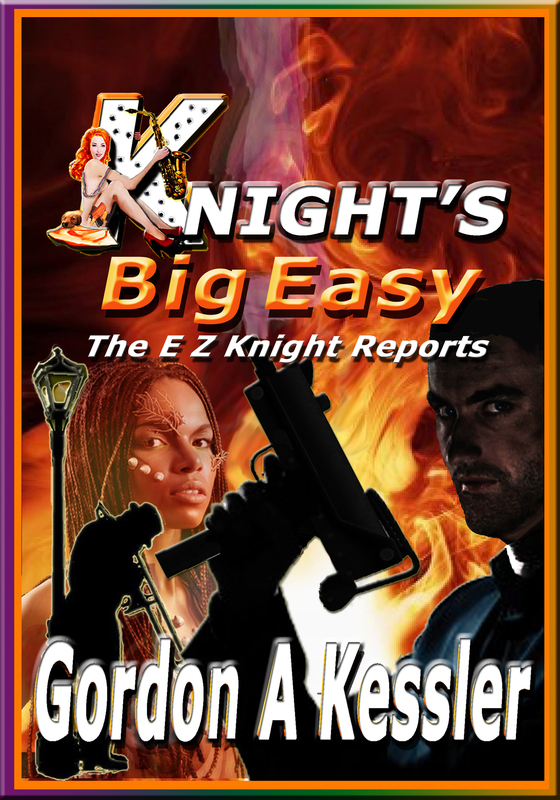 Posted in Book Covers, Books on Sale, E Z Knight, Jazzy Brass, Kessler's Thrillers, Knight's Big Easy, Knight's Ransom, Readers' Interests, The "Knight Girls"
This cover design stuff is so difficult, but so very important, as well. So I asked for your help and you gave it to me! Thanks so much to everyone who participated. We had a tie between J-4 and J-5 for the most attractive and professional-looking cover. The names of those who selected one of these two covers were then entered into a random drawing, and Tom Wingo of Oklahoma came out the winner! Again, thanks to all of you who entered the contest! Now it’s up to me to decide which one to use (I’m actually leaning toward a slightly modified M-7)! Okay, I’ll actually send you the real thing! But you have to promise to tell everyone how much you enjoyed them! Check out Christopher Elbow Artisan Chocolates at this link: http://bit.ly/bNJLZp . Many of you know Jazzy Brass, my canine heroine from my men’s action/adventure series “The E Z Knight Reports,” is also a hero of sorts in real life, too. Well, she needs your assistance this time—and you can have a lot of fun while helping! Our heroine golden retriever is unofficially teaming up with New York Times super-bestselling, action-thriller author James Rollins (in his free time, when he’s not writing bestselling novels, he’s a veterinarian—Huh? That’s right!) and his Sigma Force to help raise money for the Humane Society with a neat and fun contest. Two heroes teamed up together to help animals–wow! So, you want to be a superhero and join them, right (you’ll have to provide your own cape)? What do you get if you win, you ask? I’ll give you a hint…this is so cool…you’ll love it…wait for it…wait…here it is–I told you it was great: IMORTALITY! PLEASE check out James’s blog post on Goodreads (click!) and then visit his Sigma Store (click!). Jazzy Brass and I thank you–and I know James will, too! And it’s all rolled into one post: The Brainstorm Thriller Novel Cover Contest! is going on now through June 15! You could win a box of the coolest chocolates ever: Christopher Elbow’s Artisan Chocolates–they’re designer, wildly flavored chocolates at their best! You’ve never tasted chocolate like this before, guaranteed–and you’ll love ’em! Check it out! To enter, all you have to do is select the most popular choice of eBook cover for my thriller novel Brainstorm (it’s a mystery, it’s a thriller, it involves a taste of sci-fi and now chocolates, too!). On June 16, in a random drawing from those who’ve picked the most popular of covers, I’ll select the winner. Be a part of it! Mysterious Iris for the Lost (from “I found a body” series of three posts). We visited the site again this morning. Before the incident, I walked Jazzy past it sometimes as many as six times on a typical day. What happened Wednesday hasn’t deterred us from that ritual. For the past couple of days, we’ve stopped in the same location from which we’d spotted the body, and both Jazzy and I have stared down into the empty water. I know Jazzy has been reliving that moment as much as I. Until this morning, I’d gaze down unrealistically wishing that I might somehow see something that would replace the shocking reality we’d found. I had no choice but to look, my eyes drawn to that place in the water. This morning was different. I found myself hesitant to look, feeling eerily reluctant, as if I would find another lost soul’s vessel floating there. I knew if that happened, I would surely vomit. The first time hadn’t hit me that hard, but a second time would have sent me over the edge and into the Twilight Zone. Once Jazzy and I crept to the side of the high bank and looked over, I was relieved to see…nothing. But when we turned to leave, I noticed something I hadn’t before. Surely it was because of my focus and dread that I hadn’t noticed it: a sole iris, purple and lovely. Irises grow wild, so it wasn’t completely out of the ordinary. But as I looked closer at this fully bloomed blood iris, I saw that it was surrounded by potting soil. It had been freshly planted. I was immediately taken aback at the instant of this revelation. Someone had cared enough to leave this flower on the site of the woman’s passing. Had it been family? Had it been one of the law enforcement officers or EMTs? Or had it been a stranger? I must admit that I felt both pleased at someone’s thoughtfulness but at the same time somewhat guilty by it as well. I had unjustifiably found a sort of kinship with the deceased, the thoughts of this person and her life dominating my mind for going on three days. Some of the memory remained very unpleasant: the sight of what turtles do to a body, motionless in the water, forever etched behind my eyes; the sound of Jazzy’s frightened bark at the body’s movement while being assaulted by the turtles, sounding over and over in my ears (normally silent, she’s barked softly no more than six times before this in her eighteen months of life); and the footprints leading to the body on that muddy bank forever being questioned in my head. So has anything changed for me or Jazzy Brass? I can’t say it has in a major way. For some days to come, Jazzy will likely be drawn, as I will, to the place we’d stood on that faithful morning. I will be attracted to the flower as well, in hopes that it will continue to bloom in the absence of the life it symbolizes. I will treat my golden retriever companion’s side trips from the beaten path with more respect than they would normally deserve—her often picking up on the scent of rabbits or squirrels. After all, this is the second body other than rodents’ she’s found—the first being a yearling deer killed by a bobcat or pack of coyotes right here in suburbia last fall. I will put this day behind us in hopes of never reliving the feeling of unbelieving helplessness from less than three days ago. My self-therapy session is finished. It wasn’t on the TV news. I watched for it all day, hoping to steer my thoughts and emotions in one way or another down a rocky path. I searched the Internet for news. There was absolutely nothing. I became suspicious. At first, I wondered if there could be good reason for this information to be held from the public. A little frightening, if that were the case. Then I questioned if my mystery-thriller-writer’s brain had taken me on a side trip of its own. Finally, this morning I queried and found out. I’m still numb. I’m sorrowful for the deceased and for the family. Briefly, I felt anger at the human condition. As I write this now, I feel empathy for a life that was troubled so much: empathizing, not just sympathizing. We’ve all had our troubles, some so much more than others. Most of us are on the lighter side of that and should be so very thankful for what we’ve had and have now. I’m not talking about riches, at least the material kind. I’m talking about lives enriched with the wonders of this world enough that it’s been a positive experience more than a negative one. After all, life is a gift that should never be taken for granted. A gift; to live. Is society to blame? Do we easily cast off souls to become human driftwood? So the rest of us go on. We see another day, thankful we and our loved ones are alive one more day. We hope and pray we’ll see the sunrise tomorrow and the sunset on another good day. It won’t last forever. Enjoy it. Savor it. Take in a deep breath of fresh air and taste it, feel it, live it. Be a part of it. Look at your loved ones and enjoy the sight of them, even if only in a photo. Take a mental trip back and find pleasure in the good memories of them. And if you have arms, use them. Hug someone special to you. If you have legs, take advantage of them. Go to someone you care for, if for no other good reason but to lend them your smile to pass on to others. Never take these things for granted. And, if you have a big heart, touch it, feel it, explore it. Push it out and let others do the same in return. I’ll continue to write about death, murder and violence in my thrillers. I’ll continue to make the bad guy a living, breathing thing that, after overcoming impossible odds, can be dealt with, given his comeuppance, and stopped. But real life goes on. The real bad guys sometimes get away. And sometimes the bad guy isn’t a guy or girl at all. Sometimes it’s your own heart and mind. Sometimes it lives in your soul, becomes a part of you. It torments you. Get help. Sometimes you can’t do it alone. You can’t be the good guy all the time and put the villain in its place. Its place isn’t inside your skull or in the center of your chest. It may be deeply rooted. You might need help. Don’t be afraid to ask. There are thousands like you who can be helped if they’d just ask. Don’t allow yourself to slip through societal cracks. And don’t let anyone you love or even know slip away, either. Get help. Regardless, my heroine is my golden retriever Jazzy Brass. I thank God for her. I thank God for my family. I’m thankful for my kids and lovely grand kids, all my friends… I’m thankful for a life that isn’t always positive, but seldom all negative, and for waking to over 20,000 sunrises. Know of other important resources for our troubled friends? Please leave them in a comment. Take care, my friends, my fellow members of the human race club. Let the Good Lord grant you another, and always better and brighter, day.